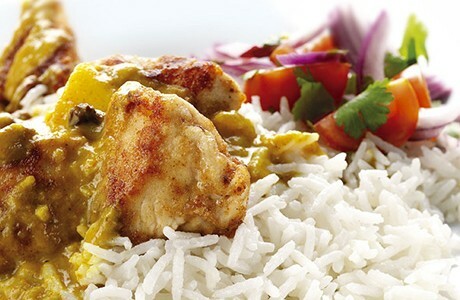 Chicken breasts with a light, crispy coating are served on a bed of fluffy basmati rice. A fruity sauce, drizzled on top, is enriched with the sweet taste of pineapple, bananas and apples which complement the chicken and rice exquisitely. Cut the chicken breast into large chunks, then lightly flour and season. Heat half of the butter and oil in a pan and cook the chicken until golden brown; this should take about 10-12 minutes. Melt the other half of the butter in a large saucepan and add the onion, pineapple, banana and half the apple. Add the curry powder, desiccated coconut, 75ml of coconut milk and stock. Bring to the boil and simmer for 20 minutes. Once cooked, pass through a sieve to form a smooth, glossy sauce. Melt the remaining butter and gently cook the apples and sultanas for 5 minutes until soft. Add to the smooth curry sauce. Rinse the rice in cold water then place into a pan and add water until the rice is just covered. Add the remaining coconut milk and boil for 10 minutes or until the rice is just cooked. Drain. Spoon the rice onto a plate, top with the chicken and a drizzle of sauce. Serve with a tomato and red onion salad.